Tribal Drinking: Why Do You Drink Craft Beer? Why do you drink craft beer? Back when I started drinking beer, in 1978, things were simple: I drank beer. Cold beer, free beer, dark beer, cream ale, even malt liquor, I grabbed it and loved it. Then I had my epiphany in 1981 with a flip-top bottle of German pilsner, and realized that I liked imported beer. I drank a lot of it: German, Belgian, Irish, British, African, French, whatever. Then I had my first Sierra Nevada Pale Ale, in 1987, and I decided I liked to drink microbrewed beer. I still do, even though most call it craft beer now. Even when I drank more mainstream beers back then I still wanted to try the different stuff: Yuengling, Genesee, Iron City, Pabst, Straub, Leinenkugel, Matt’s, Schell, Dixie, Dubuque Star, Hudepohl. Why did I tend to spurn the big brands to try the struggling regionals? I liked the idea of sustaining these older, local companies. I was honestly concerned about the erosion of America’s industrial base (I still am), and drinking a variety of beer was one way I could do something about it. I bought local meats, breads, and candies, and I still do. But mostly I wanted to be different, special, like many of us do. I wanted to like things that others didn’t know about, wanted people to come to my home and see things that weren’t like every other house. There was the camaraderie of being part of the Beer Tribe, an in-the-know clan that at that time was truly small. The first beer festival I went to was in 1987, and there may have been 60 people there, counting brewers. I bought a book with all the great beer bars and brewpubs in America at the time; it was a 40-page pamphlet. Science fiction readers (I’m one of them, too) at the time had a saying: “It is a proud and lonely thing to be a fan.” Early adopters of “better beer” (as Jim Koch of Sam Adams called it) knew exactly what they meant. Funny thing is, I found that I also simply liked the beers, everything from the sweetly crisp Genny Cream to the bitter zip of Anchor Liberty. I hankered for the fizzy mousse of Duvel, and then I discovered lambics, milk stouts, triples, rauchbier, and oud bruin, and liked them all. Therefore, examining myself, I drank non-mainstream beer because it was different; because it was local or political; because it made me part of a special group; and because I liked it. That was then, 30 years ago, and things have changed. The major difference now is that it’s no longer a proud and lonely thing to be a fan, of craft beer or science fiction. Science fiction has hit the mainstream (thanks, Star Wars), and craft beer is ubiquitous. Why do I drink it now? Pretty much exclusively because I like it, and the European classics, and yeah, I still drink Yuengling and Matt’s, too. Because I like them. So I’ll ask again. Why do you drink craft beer? Judging from the way so many people go ballistic when a cherished brewery is sold, the local/political thing is strong. 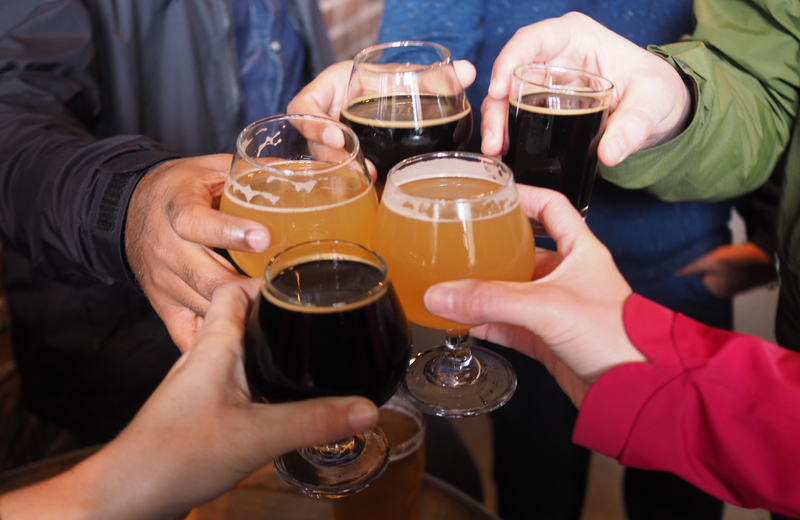 People identify with a brewery for personal reasons: it’s nearby, they know someone connected to it, or they had a good time there. Maybe it’s just because they like their attitude, and God knows, there are plenty of brewers with attitudes. If that brewery’s identity changes, you may walk away. Is it just because it’s small? Some folks like supporting tiny outfits. They like the idea of real hand-scale production, or maybe the batch variation that small production tends to, or the simple fact that it’s not a huge company that makes their beer. The problem, of course, is that if the beer’s good, the small brewery tends not to stay small, and what do you do then? Stick with them, or find a new small brewery? Do you drink craft beer because all your friends do? Maybe you drink craft beer because the places your friends like to go serve mostly craft beer. If that’s the kind of place you go, if you’re in Portland and by God, that’s what you drink in Portland, do you even think about why you drink it? More to the point, if your friends started going to a cocktail bar and drinking Sazeracs, would you start drinking cocktails instead? If you like finding something different, you’re in good company. The desire to discover something different is obvious as we race after new beers and new breweries. Where it splits is on why you want to discover that difference: is it for curiosity about what new flavors you might find, or is it score-keeping, being the first to know because you like being the first? Only you know for sure. If you simply drink it because it tastes good, will you keep drinking it if AB InBev buys it tomorrow? That’s not exactly fair, but thousands of Bourbon County Stout drinkers have already answered in the positive on that. Think about this, now: what whiskey do you drink? Do you know who makes it, or where, or who owns the company? Do you buy locally-raised meat, locally-made cheeses, do you belong to a CSA farm share outfit? What hotels do you stay in; just the best Priceline offer, or do you seek out an independently-owned place (momandpopmotels.com has some good ones)? Does any of that matter to you, or is beer different? I don’t have an answer on any of this. There is no answer. There’s no “best reason” to care about what beer you drink, and it’s not better or worse to care about beer than it is to care about whiskey, or meat, or cheese, or lodging. But thinking about why you do can be rewarding, and maybe lead you to a better understanding of what it is you’re looking for from beer, and that can help make you a happier, more directed person. A person who knows what it is they actually like, and can be happy with that glass. Great read. I drink the beer I drink because it is a hobby I share with a great…my best friend. We both had a moment of realizing a sad reality of drunkenness at the same time. We got sober together and now we are still sober but enthusiasts of good, quality, beer. We home brew together. I love enjoying a brew that I know started from where we are now. In the kitchen, just trying things out. It’s a fun hobby trying to discover the subtle nuances of a pale ale from different brewers. I drink because of the wonderful flavors, as a reviewer on YouTube I love to share my thoughts an findings with others.